Synchronous Serial Interface Adapter "DVB and ATSC"
The MTS200 Series MPEG Test Systems provide innovative solutions to meet the challenges of designing and testing MPEG, DVB, and ATSC systems. The MTS200 Series products are based on an industry-standard computing platform that provides flexible and expandable test capabilities. The MTS200 Series provides three primary capabilities: real-time analysis, deferred-time analysis, and custom transport stream creation and generation. The MTS200 Series' real-time analysis capabilities enable you to perform extensive protocol analysis in real-time. All tests conform to MPEG, ETR290 recommendations and ATSC standards so you can verify that your designs meet established conformance criteria. In addition, the MTS200 Series enables you to vary test parameters from established specifications so you can define and test the limits of your design or established system. You have control over the interval of each table, the timing relationship between related tables, as well as PCR interval and precision measurements. To ease the analysis of test results, the MTS200 Series uses color in its various displays to indicate the status of each element under test within the transport stream. Green indicates that the element under test passes; Red indicates that there is a current error; and Orange indicates that an error has occurred but is no longer present. The Real-Time Analyzer offers message logging that can be viewed either from the master log or on an individual PID basis. A statistical view (see Figure 1) provides a status-at-a-glance display of the overall bandwidth and efficiency of the transport stream under test. Graphic and dynamic displays show the data rates, percentage of use, and global data information for each program, PID, and the transport stream. 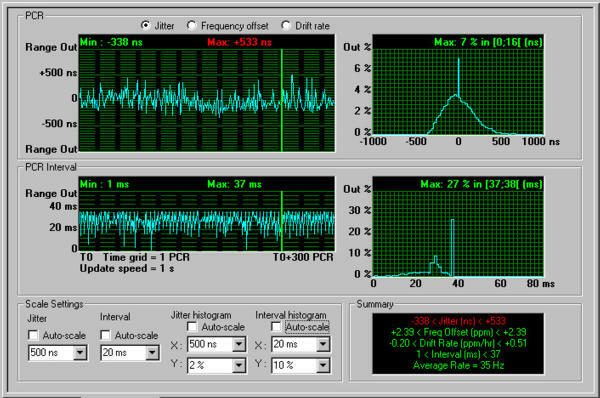 Figure 1 - Typical MTS200 Real-Time Analyzer screen. This screen displays information and analysis results of the MPEG transport stream being monitored. PCR Analysis with frequency offset and drift information (see Figure 2) are displayed in real-time. The real-time analyzer enables you to use MPEG, DVB, or ATSC limits, or you can define your own. Once the limits have been defined, the system begins testing to that limit. Errors are graphically displayed in red and added to the message log with time of day and date information. The real-time system also enables you to display multiple PCR views simultaneously to assist in identifying multiplexer or encoder problems. Figure 2 - PCR analysis view screen. The PCR, PTS/DTS, and section rate analysis displays now include histograms. An example histogram can be seen in Figure 2. The PID Allocation view (see Figure 3) enables you to view all PIDs associated with either PSI/SI/PSIP or program tables and monitor their rates. High and low limits can be set to alert the user with error messages when these limits have been exceeded. This is especially important when monitoring the output of a statistical multiplexer and trying to identify a program that may be using too much bandwidth. 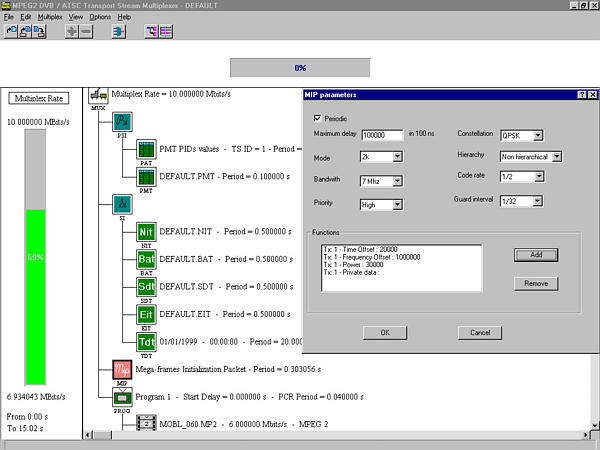 Figure 3 - PID-Allocation screen. DVB ETR290 measurements can be monitored using two display types. The first display type is used strictly for monitoring while the second display type is a detailed view. Both views indicate the three priorities of testing per ETR290 recommendation. Mega-Frame Initialization Packets (MIP), specified in the DVB TS 101 191 document, can be monitored using either the Real-Time or Deferred-Time Analysis programs. MIP's carry information about the type of transmission that will be used to broadcast the transport stream. It is used to synchronize and to configure DVB-T transmitters (SFN adapters) using GPS-based time stamping. Due to the increase in demand on accessing Internet services through cable and satellite communications, IP data monitoring has become an important issue. The MTS200 Real-Time Analyzer performs IP monitoring with detailed viewing of SI-DAT 360 (DVB Data Broadcasting) tables, syntactic control of the SI-DAT tables with error reporting, and the ability to monitor data flow of the broadcast session. Several new tables are now available within the hierarchical display. Digital Storage Media Command and Control (DSM-CC) from ISO/IEC 13818-6 defines the following types: Multiprotocol encapsulation, U-N messages, and Stream descriptors. SI-DAT defines the following tables: 1-layer Data carousel, Multiprotocol encapsulation, 2-layer Data carousel, Data Piping, and Data Streaming. Figure 4 shows multiple DSM-CC elements along with their IP traffic sessions. Figure 4 - IP Data Monitoring. Hardware - Set the number of synchronization bytes before the system begins testing or synchronization is lost. 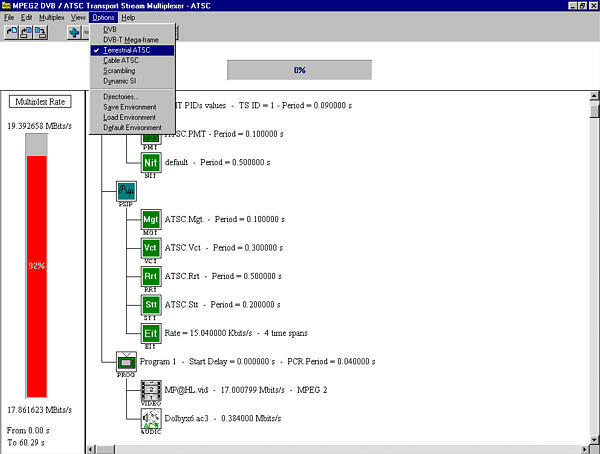 Set the electrical input and output configuration of the Real-Time Analyzer. Analysis - Select the type of testing to be performed (MPEG, DVB, or ATSC). Select individual ETR290 tests. 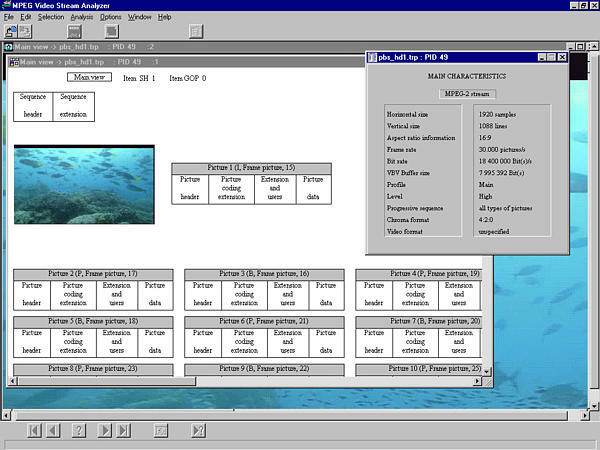 Select individual MPEG-2 programs for analysis. Advanced Analysis - Select packet ID and table interdependencies. Configure syntax, timing, and rate requirements. View - Enable NT Event logging. Configure message, hierarchical, and graphics displays. Data Storage - Configure trigger event, file name and size, and repetition mode. Output Filtering - Select MPEG-2 programs and PIDs to be removed from transport stream. This program allows the user to describe the syntax of a private table. You can then use the table for testing the syntax of the incoming transport stream, validating the private table information. Intermittent problems are difficult to detect and capture. The MTS215 MPEG Test System addresses this by incorporating a trigger/capture function (see Figure 5) that enables you to specify an error or event to be monitored, start the process, and walk away. When the designated error or event occurs, the system automatically captures the event so that it can be analyzed at a later time. The system can capture a minimum of 35 minutes of data running at 60 Mbps. 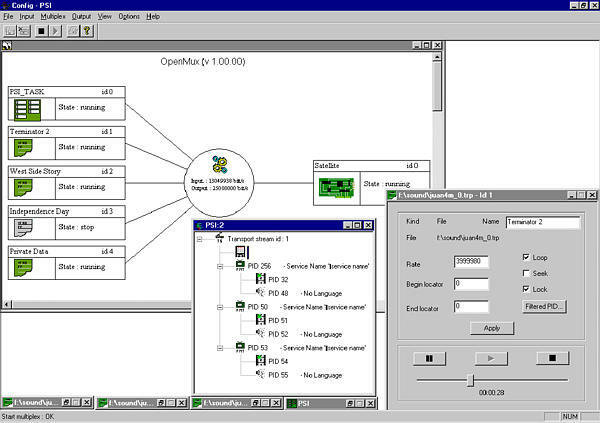 Figure 5 - Data Storage Trigger/Capture configuration display. If you are using the MTS200 Series Real-Time Analyzer in an operational network environment you can take advantage of the SNMP agent that is a part of the real-time system. This will allow you to control or capture analysis results from a remote location. Hierarchical - Displays the structure of the transport stream and identifies all of the components. Interpreted - Works as a tutorial on the MPEG structure. Double clicking on any of the fields in the display produces a definition of that field from the MPEG standard. Graphical - Uses graphs to show information about PCR (jitter analysis), MUX Allocation (rate analysis), and the PID Map (for viewing "burstiness" of data). Numerical - Shows decimal, hex, or binary versions of each display. Tests performed in deferred-time are listed below and determined by the user-defined measurement environment. Syntax - Testing of the system layer (including PES) to ISO/IEC 13818-1. Consistency - Between the DVB SI and ATSC PSIP source information tables. Dynamic - Full T-STD (Transport stream System Target Decoder) including LTW (Legal Time Window) and Buffer Smoothing. All of these tests can be performed automatically. You also have control of the buffer size in each of the T-STD buffers. MPEG audio and video elementary stream analysis is also possible with the MTS210 and MTS215 systems. These programs allow you to perform syntax and semantic analysis of both audio and video elementary streams (see Figures 6 and 7). Figure 6 - MPEG video screen. Figure 7 - MPEG audio screen. Both syntactic and semantic (coherence between all components in the stream) analysis are available. An extraction routine allows the user to select and save either the whole stream or a part of the stream. 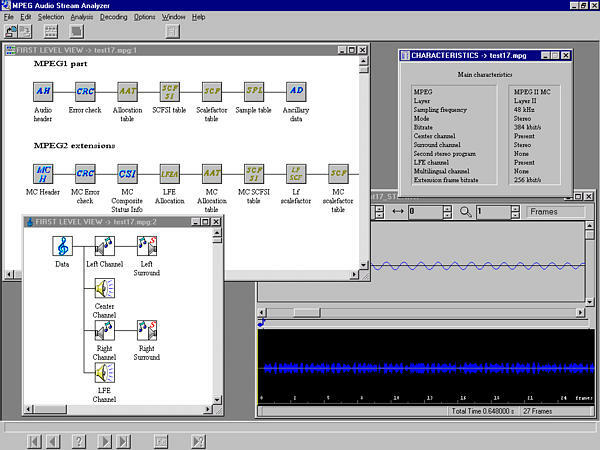 The MPEG Audio Stream Analyzer analyzes MPEG Audio Layer I and II specification streams. It allows analysis of an MPEG audio stream at different levels as well as the ability to decode them. At each of these levels, syntactic, semantic, and CRC analysis can be performed. An extraction routine allows the user to select and save either the whole stream or a part of the stream. The decoded stream can be saved in a WAV file format. The interpreted display shows the actual data along with each parameter field name. Double-clicking on the field name produces a definition of that field as defined by the AC-3 standard. 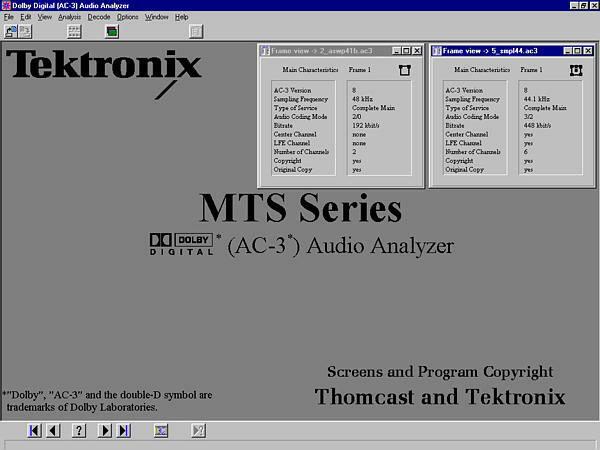 Figure 8 shows the Dolby AC-3 analysis application along with two characteristics views. All or part of an AC-3 stream can be saved on a frame or time basis. Figure 8 - The Dolby AC-3 analysis application with two Main Characteristics displays. These parameters can be easily modified using the included DVB or ATSC Table Editor or Jitter Programs. Using a "known good" transport stream, you can test performance of the entire system or an individual component under ideal conditions. Because you have control over the user-definable parameters, you can create a custom transport stream with variations to stress performance at or near operational limits. For example, Figures 9a and 9b show custom transport stream creation. CD-ROMs with elementary streams are included with all MTS200 Series systems having generation capability. The video elementary streams contain both motion sequences and traditional television test patterns. The STRM102 product is included and contains MPEG video elements from the Sarnoff Corporation for independent certification of MPEG interoperability. These "known good" MPEG streams can be used as ideal test signals or they can be used as the basis for creating your own MPEG transport streams. Figure 9a - Example Custom ATSC Transport Stream with PSIP Tables, High-Level MPEG-2 video, and Dolby AC-3 audio. Figure 9b - Example custom transport stream with Mega-frame. The purpose of the Real-Time Multiplexing application is to provide an easy way to multiplex MPEG-2 Transport Streams in real time. The heart of the application is a transport packet multiplexer task that can quickly process many input streams and outputs a valid MPEG-2 stream. The input transport streams can represent a single-program transport stream (SPTS) or multiprogram transport streams (MPTS), elementary streams, private data, PSI tables, DVB-SI tables, or ATSC-PSIP tables. Dynamic management of MPEG2 PSI, DVB SI, and ATSC PSIP tables. SPTS and MPTS file multiplexing. Allocation and dynamic filtering of PIDs. Figure 10 - Real-Time Multiplexing screen. The MTS200 Series provides rear-panel I/O connectors for external acquisition and generation. The exact connector configuration depends upon the system ordered. The Synchronous Serial Interface (SSI) adapter accepts MPEG-2 transport streams at 19.39 and 38.78 Mbps meeting the SMPTE 310M standard. The SSI adapter will also accept SSI streams that meet the DVB standard over a frequency range of 10 Mbps to 50 Mbps. An automatic detection circuit allows the adapter to act as either an input or output device. MTS205 Real-Time Analysis System. Designed for fast, time-critical system analysis. MTS210 Deferred-Time Analysis System. Designed for out-of-service (offline) analysis. The MTS210 requires one of the three options: Option 1A provides acquisition and analysis only, option 1G provides custom transport stream generation only, and option AG provides both analysis and transport stream generation capabilities. Other MTS210 options include: 1R, OM, ES, AC, PS, CA, and SS. MTS215 MPEG Test System. Combines both the MTS205 and MTS210 capabilities into a single system.